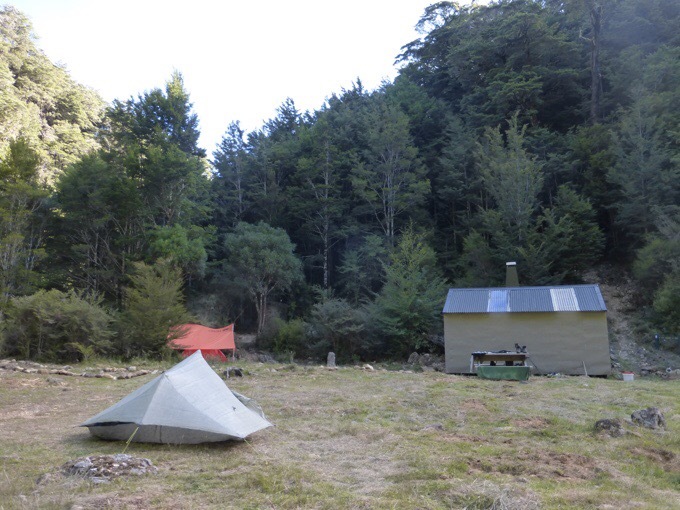 I didn’t sleep well in the hut with a snorer, and was awake at 5am. I tried to go back to sleep for awhile, but as soon as I heard someone waking, I figured it was a good time to pack up. All five of the other hikers also were packing up, so that was nice to not be the only one getting an early start. We all knew there was a big climb today, and were hopeful that winds would be calmer in the morning, so everyone got an early start. I was the first one to leave and hiked out at 6:30am. 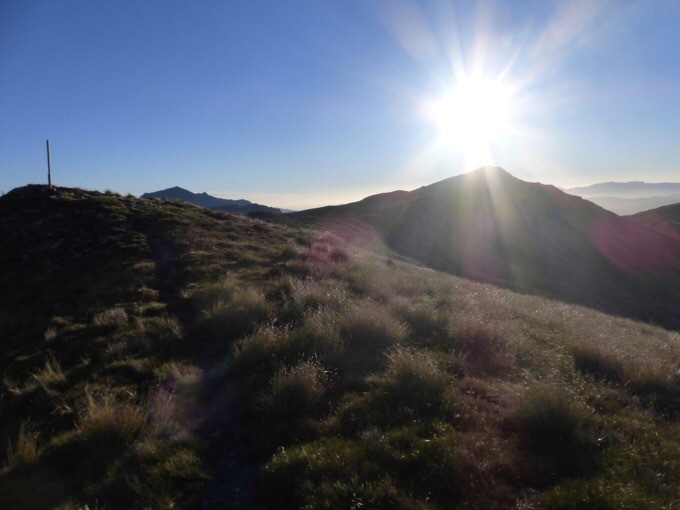 Immediately, it was an uphill hike through tussock with the sun rising directly in front of me over the mountains. It was so bright that I had trouble seeing where the tall orange poles to follow were sometimes. Today was a day jam packed with elevation changes. It was pretty much anything, but flat. I won’t detail each climb’s stats, but total today, I did 5,679ft/1,731m ascent and a whopping 8,942ft/2,726m descent over 18mi/28km. Was it tiring? Let’s just say it’s only 8:15pm right now as I type this and I’m already dozing off. I’ll be fairly brief for the sake of time and the fact that not much else happened other than walking up and down big rocky mountains. Don’t get me wrong, it was a great day, but for readers, a bit mundane. 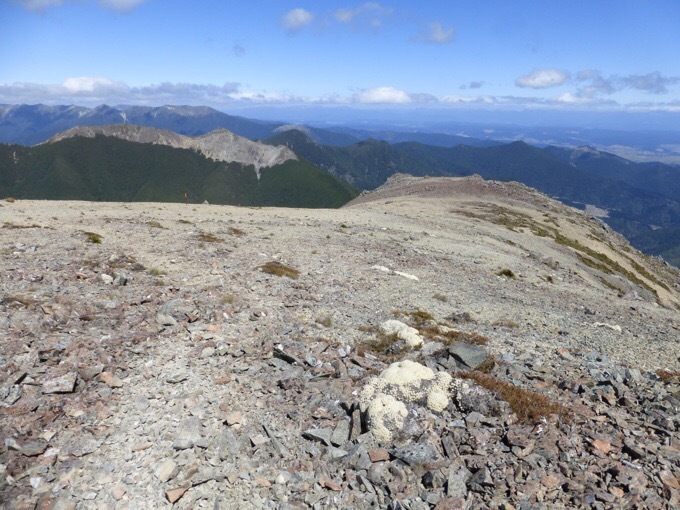 I am super lucky that other than some winds, it’s been a great weather window to get through the Richmond Range. It can get extreme quick up in the exposed sections, so I keep a close watch on the weather. I’ve seen that rain is moving in the day after tomorrow for a few days, and that has been my main motivator. I want to do what I can to make sure I’m out of the exposed stuff and stream crossings before the rain comes. 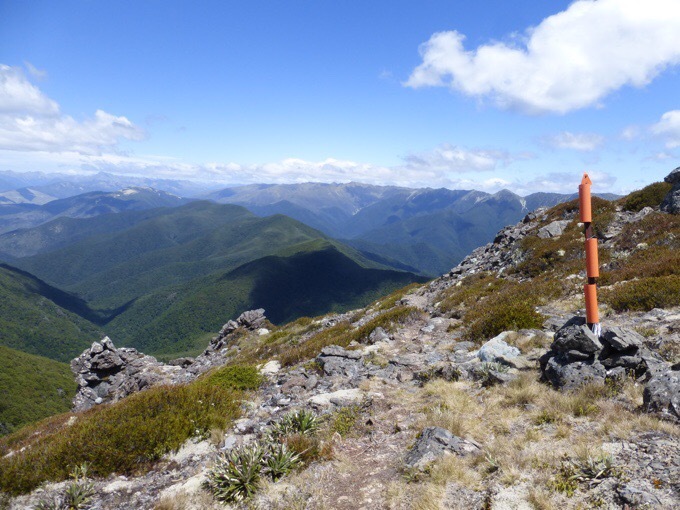 The big climb of the day was Little Rintoul and Rintoul Summit. The morning started out on pretty good trail that actually reminded me of being on the Continental Divide Trail. 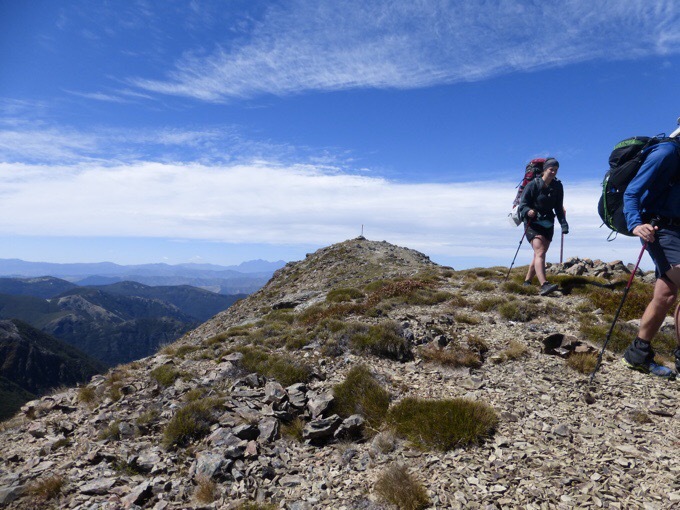 When it was time to climb Little Rintoul and Rintoul Summit, the trail dipped steeply down and back up on some loose rocks that made for slow terrain. 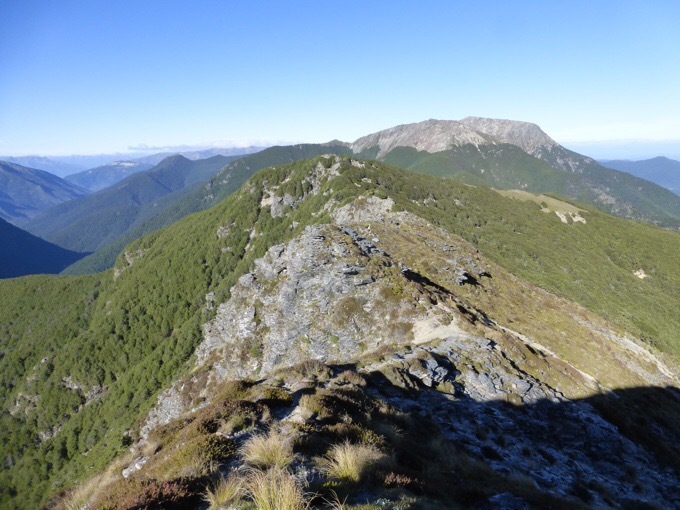 The route goes to the left and then steeply down and back up Mt Rintoul on the right. Some of that terrain made me think of the cross country stuff I did in the Sierra this summer. Some rock hopping of sorts and unstable terrain that shifted as I walked on it. 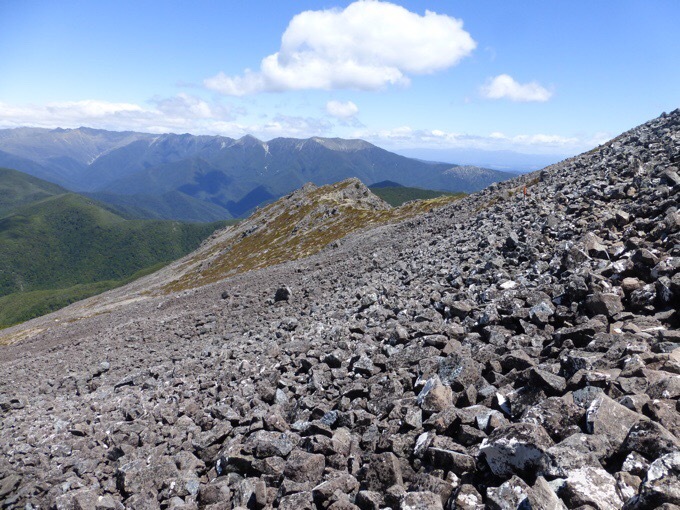 Dropping steeply before going up Mt Rintoul in the center. 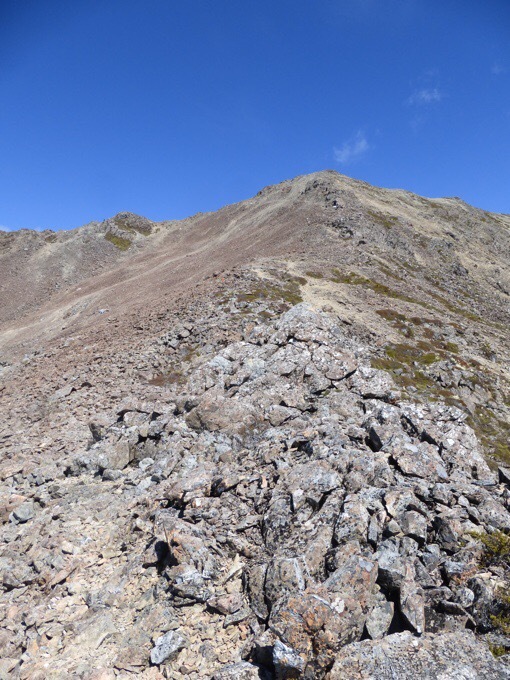 As I climbed, I saw a pair also climbing to the final summit and caught up to them at the top. 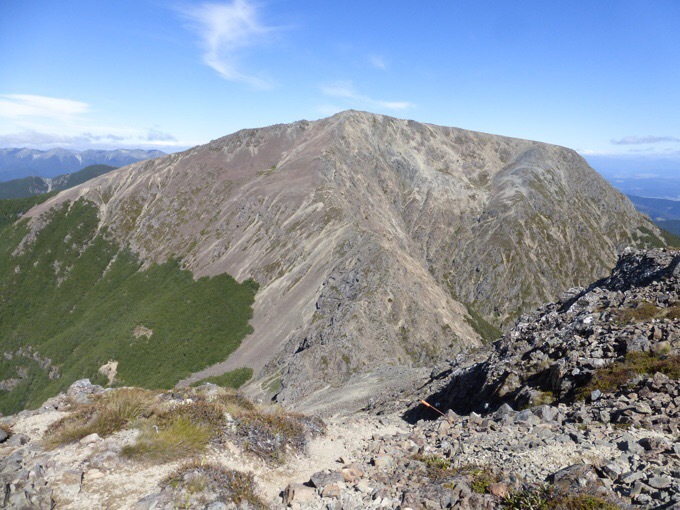 Both were solo hikers that just started only the South Island. There are a lot of those out here right now. 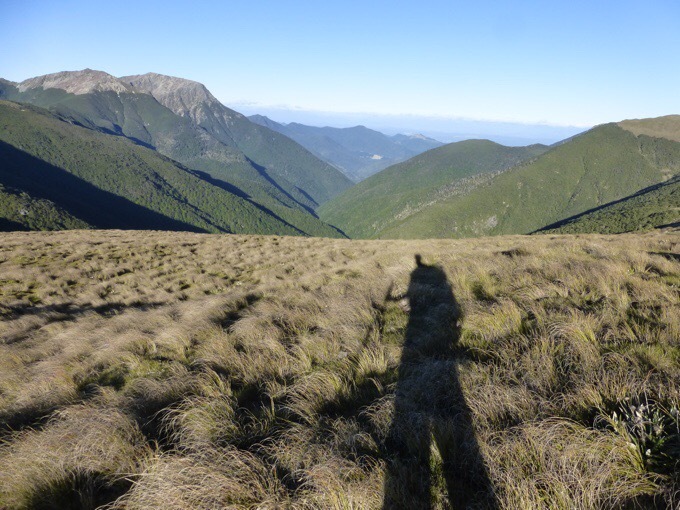 I only saw them briefly as they are still getting their trail legs in their second leg of the South Island. This would be quite the beginning to a hike to jump into this stuff so quickly. They were nice enough to take a summit photo for me before we parted ways. 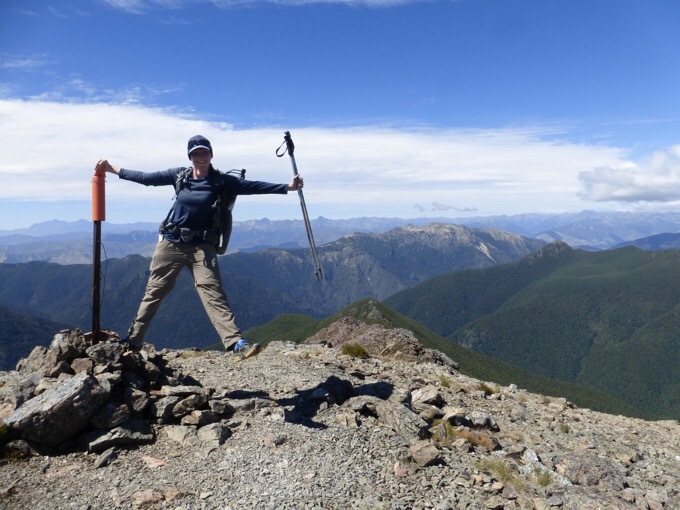 The top of Mt Rintoul Summit. 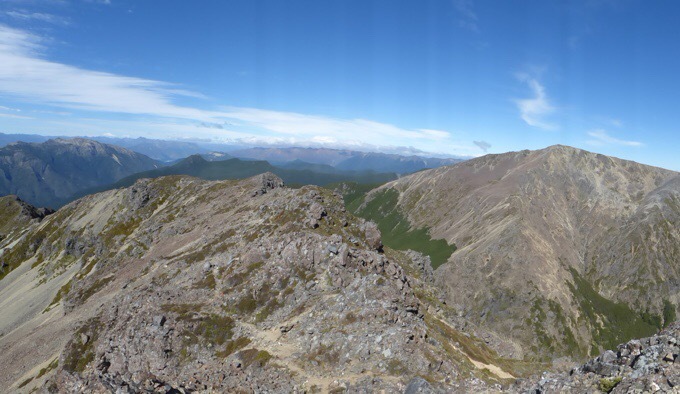 Going down to Mt Rintoul Hut was quick and I was down at the hut by noon. 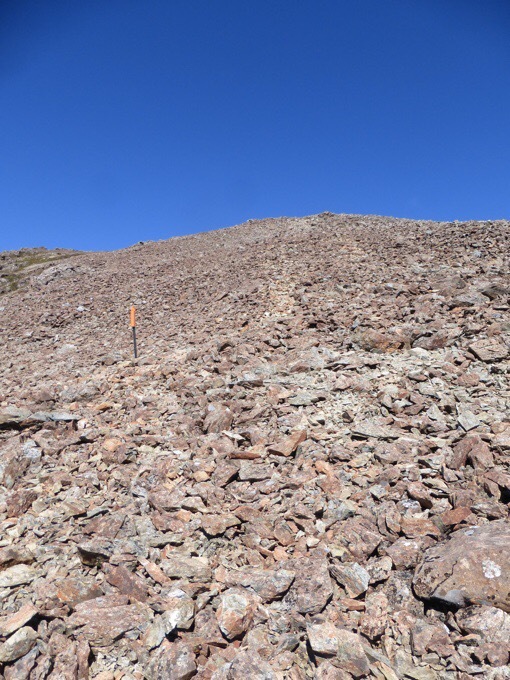 It was a great descent that started gradual and then had that fun gravelly ski downward. I decided to walk a bit more before stopping for lunch on the way up the next climb of Purple Top. I had lunch in the trees just before it broke out of tree line on that climb. That section also had some rocky terrain at times that was slow going. All the views were great and I was glad to be doing this all in a non-stressful weather situation. After Purple Top, the downhill began. I am pretty good at downhill and liked this kind that was forested and not too steep or rooted or rocky to get a good flow going down. I made great time down to Tarn Hut, and was there by 3pm. 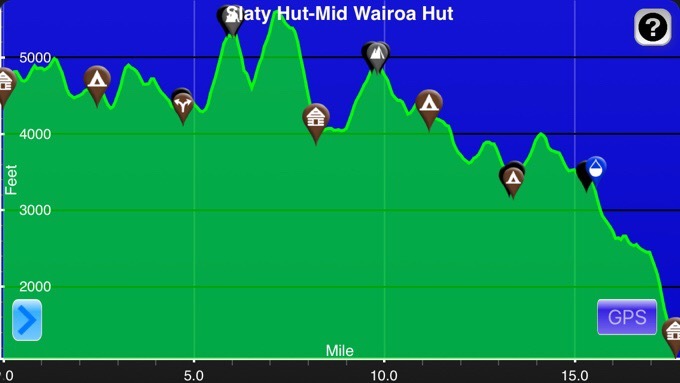 I intentionally pushed the pacing today knowing that when Why Not did this day, she stopped at Tarn Hut, but almost had time to make it a bit further to the next hut, Mid Wairoa Hut. 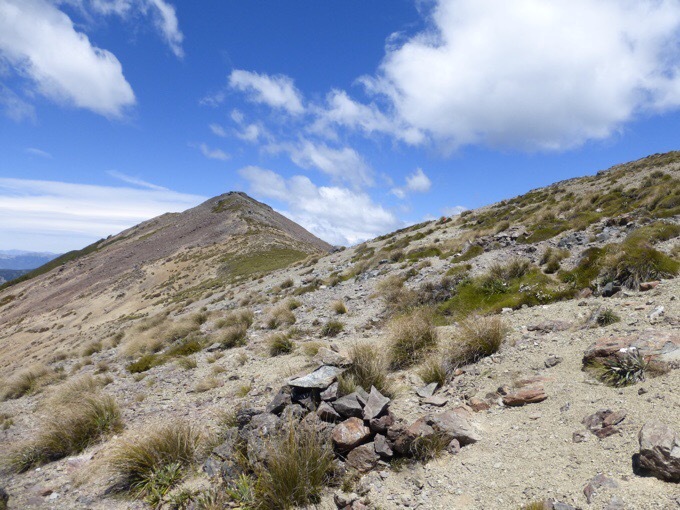 I was thankful to her for mentioning times on her journal and I knew that if I could make it to Tarn Hut by 4pm, I could make it to Mid Wairoa. 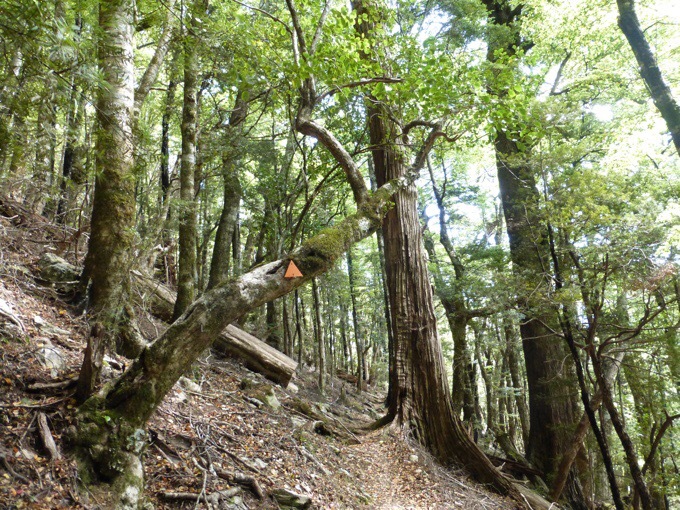 There was a young German hiker there also just starting the South Island that I met near Havelock before doing the Abel Tasman and I convinced him to also hike on and get more done before rain comes in two days. The downhill was on great trail that was soft and not as steep as expected. The final kilometer was steeper and took more care, but most of it, I was able to cruise down fairly quickly since I like downhill. Times vary greatly depending on personal comfort with downhill. It is estimated to take 4hrs and I did it in 2hrs and 10mins. Why Not, who doesn’t love downhill did it in 2hrs 45mins. For anyone that has the opportunity to squeeze this one in at the end of the day, I recommend it. Definitely nice to have that one out of the way and be low. 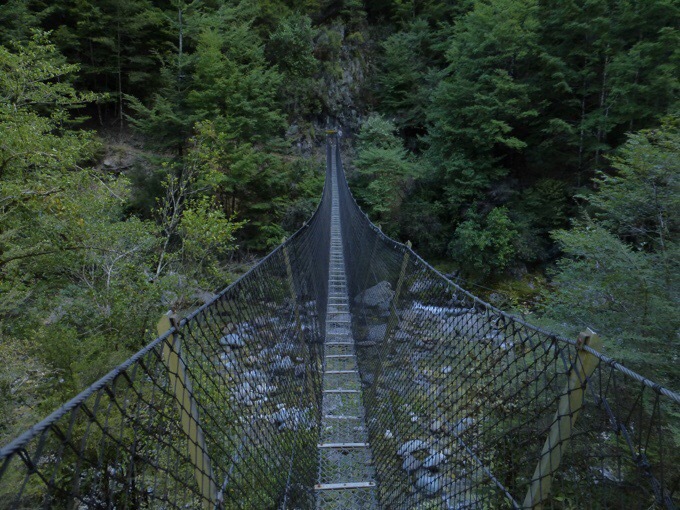 There was a suspension bridge over the left branch of the Wairoa River and the hut is just above the river. 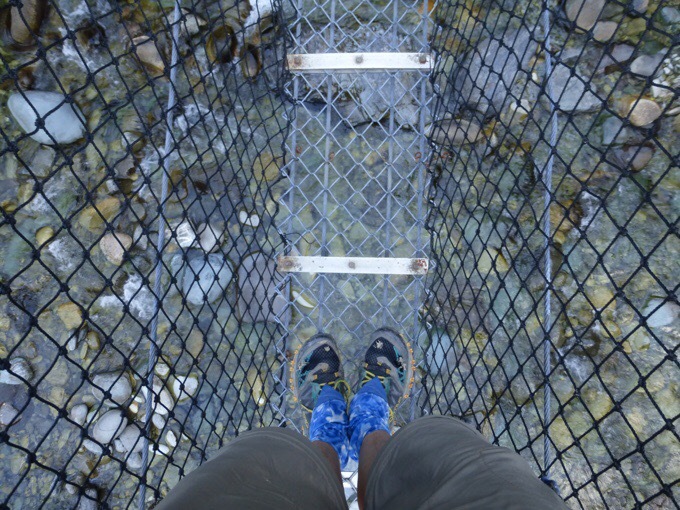 Creepy to see through the bridges high above the streams. I expected a full hut given how people had indicated where they’d be stopping in the hut registers, but the herd of six ahead of me made it down early enough that they decided to push on. Everyone knows rainy weather is on the way and seems to be making the right choice to push longer days today and tomorrow before it hits. There were only four others at the hut and one of them was camping. Since it’s sheltered from the wind down here, and I love sleeping with the sound of a nearby stream, I chose to tent. Two of the guys here work for the DOC (Dept of Conservation). They were helicoptered in and are doing trail and hut maintenance in this area for a week. 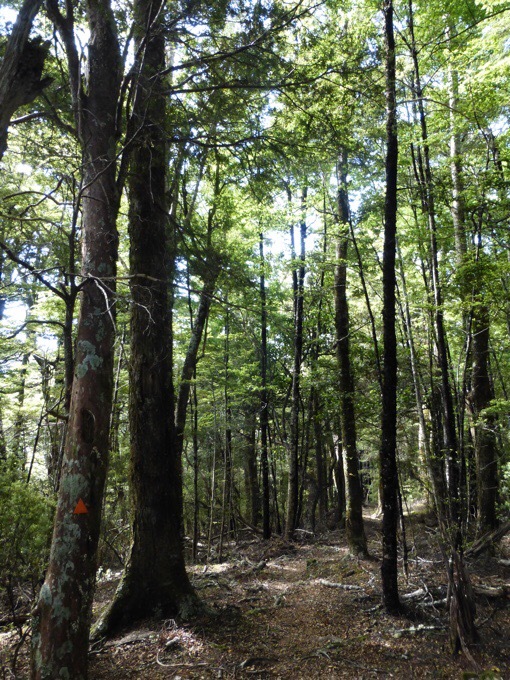 The funding here is much less than in the US to maintain the trails and they said they tend to come out once a year to do a full cleaning and clearing. They were nice and even took the trash us three thru-hikers had. I am definitely tired after these days of keeping a pretty solid pace, but it’s paying off. Clouds are gathering, and I hope the rainy front doesn’t move in early. At this pace, I should be hitting town the day after tomorrow just as the rain is starting. I’m going to sleep hard tonight! Wow, that is a LOT of elevation gain/loss. Glad you are having fun. All that downhill isn’t so nice on the knees though. Sounds like it was a super successful day for you! 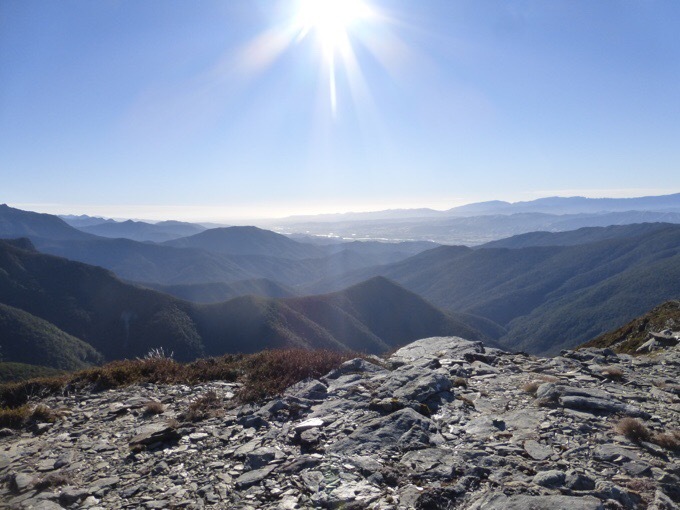 And those expanses of rocks really do hark back to your Sierra summer days. On Warren’s wind map the winds there are fierce!